Jess Productions Limited was the producer of the Oxted Beer & Music Festival in 2017. Before that, Jess Productions' (managing director), Sam Hasler, produced the Oxted Beer Festival in 2014, 2015 and 2016. Jess Productions and the team are really pleased to have been able to support Oxted Pre-school with a donation from some of the funds raised in 2017. Oxted Pre-school is a charity run pre-school, which has been operating for over 30 years in central Oxted. They believe that 2-4 year olds develop best when learning through play in a fun environment and as such we are really pleased to be able to help them with the purchase of new resources. 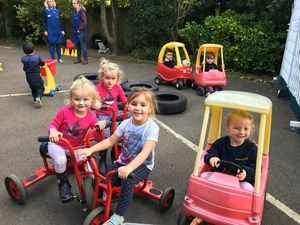 They have already bought a fantastic den and a range of new trikes for the children to play with in their front outdoor space and are in the process of buying a new trampoline for their back playground. They are also using the donation to invest in a range of new books and puzzles to stimulate young imaginations. If you would like to find out more about Oxted Pre-school, pop down during opening hours, Monday - Friday, 9.15am -2.45pm (term time) or visit their website. 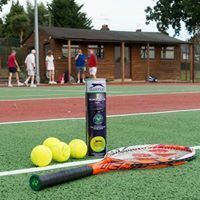 Hurst Green Tennis Club are currently looking to start up a junior section. In order to help them on their way a donation was made which will go towards the purchase of junior equipment for the kids to use. We wish them well and what a great thing to be getting kids involved with sport! Please contact Hurst Green Tennis Club for more information. Connie was diagnosed with Acute Lymphoblastic Leukaemia (ALL) when she was 4yrs old. By the age of 5 she had lost her hair, her mobility and was in constant pain due to side effects of high dose chemotherapy and steroids. It has been a challenging couple of years for her but she rebuilt and looked forward. She started running to give something back to the Marsden who treated her. Our fabulous Festival stewards who can be found welcoming everyone in and handing out our Festival glasses, also play a big part in distributing funds raised to lots of good local causes and projects. One of the causes they are choosing to support from their tremendous efforts at #OXBF17 this year is a much needed Multi Use Games Area for Downsway and St Mary's School. Please click on this link www.st-marys-oxted.surrey.sch.uk to find out more information about this great community project. A very popular funding choice amongst the volunteers this year. Edenbridge Rugby Club were invaluable at pouring thousands of pints of lager at our very busy craft lager bar! 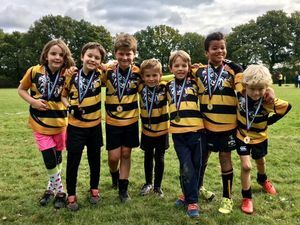 ERFC have used the funds donated to provide much needed equipment for the huge junior section at the club. Click on this link if you would like to find out more about ERFC and for details on joining. 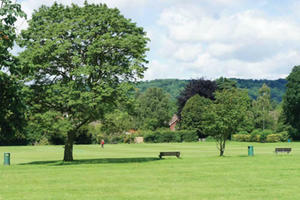 The Festival is always keen to support our beautiful venue and to assist with the costs of the upkeep of the park. We were very pleased to be able to make a donation, on top of the rent paid for the venue hire, towards the upkeep of the playground facilities. Many people are not aware that Master Park is in fact a charity and relies heavily on donations for maintenance costs etc. Please go to their Website to find out more about their latest projects and check out their "Events Page" to see all the other fabulous events that go on during the summer months at our lovely Master Park in Oxted. 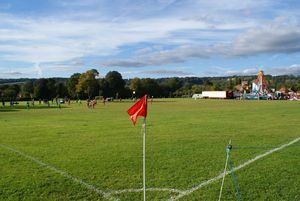 Funds from the #OXBF17 event were used to completely reseed and fertilise the 1st team football pitch shortly before the start of the season this year. We must say it was looking very lovely and green at the start of September. The 1st team pitch takes a bit of a beating in the summer months and we were very happy to help give this ground a bit of nourishment! We wish ODFC good luck with this season. Now cricketers, so we are told, have always enjoyed a pint of Beer and it would seem the OLCC are no exception! We have it on good authority that their party in the pavilion after beer festival has closed is really quite the place to be! ;-) Thanks to the volunteers who showed their support of OLCC by volunteering in 2017. We have made a donation to OLCC from the Oxted Beer Festival in 2017 and we are looking forward to hearing how they will be using this to benefit their club. For further information please visit their website. A group of teenagers from Oxted School spent their Saturday and Sunday mornings of Beerfest weekend cleaning the streets of Oxted in order to raise money for their community project in Indonesia. 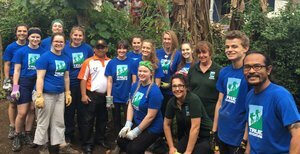 A week after the Oxted Beer Festival 2017 the teenagers set off for Indonesia with True Adventure Group and spent one of their weeks there working on a local community project. Well done to all of you, you did a smashing clear up job!! © 2019 - Jess Productions Limited.